The Fantastic Mr. Fox: Wes Anderson's latest is one of his best; his first foray into stop-motion animation has a freshness and joy that had rather seeped out of his last couple of outings. It's funny, it's charming, it's a treat. 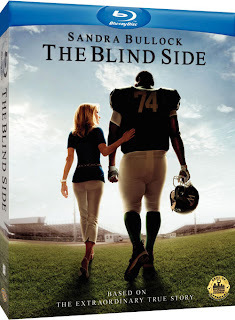 The Blind Side: It's a functional enough based-on-a-true-story weepie, and Bullock is good (if not the best of this year's Best Actress nominees). But the picture's casual racism remains troubling, and mostly unnoticed. Brothers: Jim Sherican's family drama/war picture is old-fashioned (in a good way) and well-made, though the spoiler-heavy marketing and a couple of structural choices keep it from true greatness. The Men Who Stare at Goats: The feature directorial debut of Grant Heslov (who collaborated with star George Clooney on Good Night, and Good Luck) shoots for the stars, conjuring up the spirit of Dr. Strangelove and M*A*S*H; he doesn't hit the mark, but the film has some laughs and enjoyable performances, particularly from Clooney and Jeff Bridges. Mad Men (Season 3): TV's best drama (yes, even better than Breaking Bad, but just barely) only got stronger in its third year, delving deeper into the complex personal dynamics and gearing up for a full-on reset. Screener discs went out strangely late; my review will be up later this week. Phantom Punch: There's just not much to recommend in this shoddily written, badly-paced, poorly produced Sonny Liston biopic; it's a long way from Ali, and a long fall for once-promising director Robert Townsend.